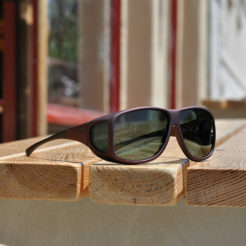 A rich, burgundy Soft Touch finish perfectly paired with our polarized copper lens system. Precisely engineered to dramatically increase contrast, the Polaré copper tint is much sought-after as a driving accessory. The enhanced depth perception delivered by the unique tint helps improve safety whilst bathing the eyes in a warm light that reduces eyestrain and fatigue. The copper on burgundy combination makes a definitive fashion statement without sacrificing performance. Designed to accommodate even the largest prescription glasses, the architecture of our Aviator has become iconic.